The AirClean 7000 is designed for handling large industrial buildings such as factories, power plants and mills. Equipped for cleaning and vacuuming anything that comes its way, the AirClean 7000 can handle dry air containing asbestos, mold, construction, quartz, powder and wood dust. It’s primarily used for creating negative pressure in ventilation ducts. This vacuum unit creates a large air volume and airflow of 18-22m/s, which ensures the total removal of brushed dirt. 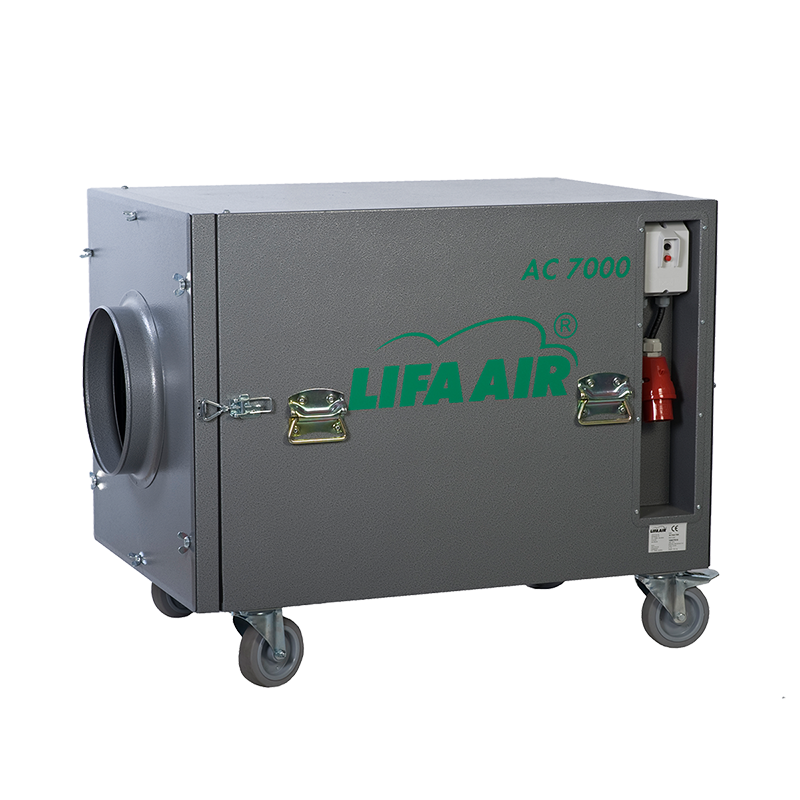 Lifa AirClean 7000 is a multi-function machine. Its main use is for creating negative pressure, cleaning large and broad ventilation duct systems. The vacuuming unit is able to create not only a large air volume, but also gale force airflow of 18-22m/s, which ensures the total removal of brushed dirt. AirClean 7000 is also suitable for dust-free work demanding a large volume of suction air. It can be used e.g. for cleaning and creating negative pressure in spaces with dry air that contains asbestos, mold, quartz, powder and wood dust. Lifa AirClean 7000 uses triple-phase current with Lifa filters. The airflow of the machine without filters is 6950 m3/h. The sealing and separating level of the Lifa AirClean 7000 has been tested. The vacuuming unit is very suitable for to removing even the finest dust from the air, which is why it is used in problem dust renovation. The exhaust air does not need to be conducted outside when using a Hepa filter. The Hepa filter has an extremely high separation level, which removes 99.97 % of particles over 0.3 µm in size. The machine thus meets the criteria set for machines used in asbestos work. When the machine uses a micro filter, a bag filter is used as a pre-filter. This is installed into the bag filter case - the Lifa PreBox - which is available as an accessory. The machine is equipped with filter combinations suitable for the work or cleaning target. The manufacturer requires the use of the filter combinations listed in the table. A broad selection of filters is available for the machine. The size of the suction opening of the Air Clean 7000 is Ø 500 mm. A Connection unit AC7000, which compresses the size of the opening to 315 mm, is available as an accessory. A flexible accordion hose of Ø 305 mm can be attached to the connection unit, and installed near the demolition site or ventilation duct. The contaminants formed during the demolition work and in cleaning the ventilation ducts are sucked directly into a dirt collecting unit (= bag filter). The exhaust side of the machine is equipped with a connector attached to a plastic film sock, with which the exhaust air can be conducted outside the work site. As the machine is equipped with wheels and handles, its delivery to the work site is easy despite its large size and it stays in place during the work due to the lockable wheels. The side of Lifa AirClean 8000 is equipped with sliding beams, with which it is easily moved into a van. In addition, the machine is equipped with wheels on its longer side, so it can be placed or delivered in a horizontal position. The Lifa Telescopic lifting set, available as an accessory, enables the connection hose of the vacuuming unit to be attached to the ventilation duct. The band of the telescopic legs holds the connection hose firmly in place during the cleaning operation. There are several good reasons to keep duct cleaning regularly. Securing good indoor air quality, saving energy and money, extending the HVAC system life-time and reducing household dust makes duct cleaning a good investment.